It's finally here! The 2015 AHR Expo kicked off today, with a record breaking number of attendees and exhibitors. With hundreds of new products launching at the expo, there isn't a lack of HVAC innovation. Setra, this year located at Booth 3823, is featuring 5 new products ranging from room isolation monitoring power metering. The most important factor to consider when selecting a power meter is the total installed cost which consists of the cost of the meter plus the labor associated with the installation. Knowing the installed cost will improve your estimate accuracy, leading to more project wins! Wouldn’t you like to save time on installation therefore reducing your total installed cost? Of course you would, and the Power Patrol can help you do that. Using Setra's Power Patrol, the installation time will be roughly twenty seven minutes! See the breakdown of the average installation time of Setra’s Power Patrol. The greatest time loss in meter installation is usually in configuring the meter, installing CT’s around busbars or cable bundles, and safely/appropriately mounting the meter. The best meter for a job will meet the application requirements and can be installed effortlessly. 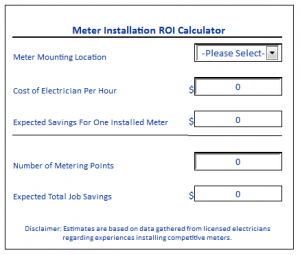 The best meter for the job will have the lowest total cost. Couldn't make it out to Chicago to attend the largest HVAC event in the world? Don't worry, we got you covered. CLICK HERE to download Setra's Meter Installation ROI Calculator and see the savings for yourself.